Sea and Summit Scotland is underway. 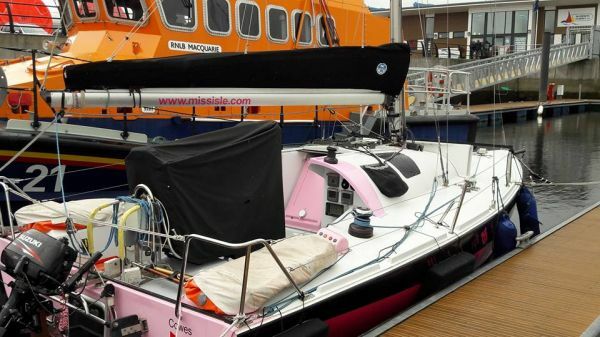 Natasha, and the team, left Inverness marina on Monday morning. Spirits were high, despite facing grey drizzle and missing out on the hot weather and blue skies further South. The first challenge was the locks on the waterway running alongside the River Ness. These took time to navigate, but the team all pitched in and the first of the locks were soon behind them. First stop on Monday was Dochgarroch. Natasha was delighted to find that the campsite was right next to her beloved yacht Miss Isle Too so she could keep an eye on her. On Tuesday Natasha was joined by Loch Ness RNLI team​ who were on a training exercise. Having left the waterways behind it was a joy for Natasha to put the sails up and get sailing. 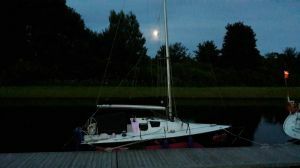 Although the wind was fluky on Loch Ness the sailing was good, no monsters were seen and the team reached Fort Augustus. Today (Wednesday) the weather has turned and Natasha and her sailing team are battling heavy rain as they make their way down the next flight of locks. Natasha is joined on the first part of her Challenge by coach Phil, dad Gary, mum Amanda, sister Rachel, carer Cherrell, Rib driver Tony and support driver Andrew.